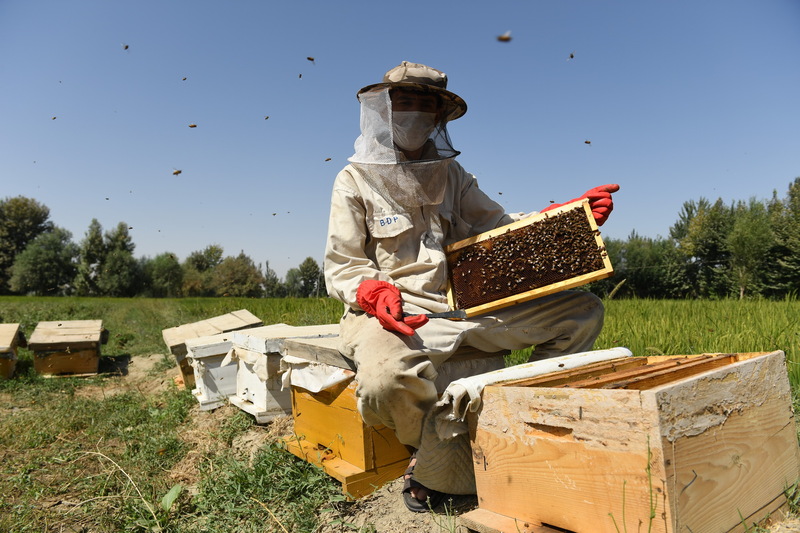 Training underway at the Beekeeping Centre in Takhar, Afghanistan. Training underway at the Fruit Processing Centre in Takhar - In rural Afghanistan, the Aga Khan Foundation provides industry-relevant vocational training for men and women -- many of whom are refugee returnees -- to increase their employability and entrepreneurship. 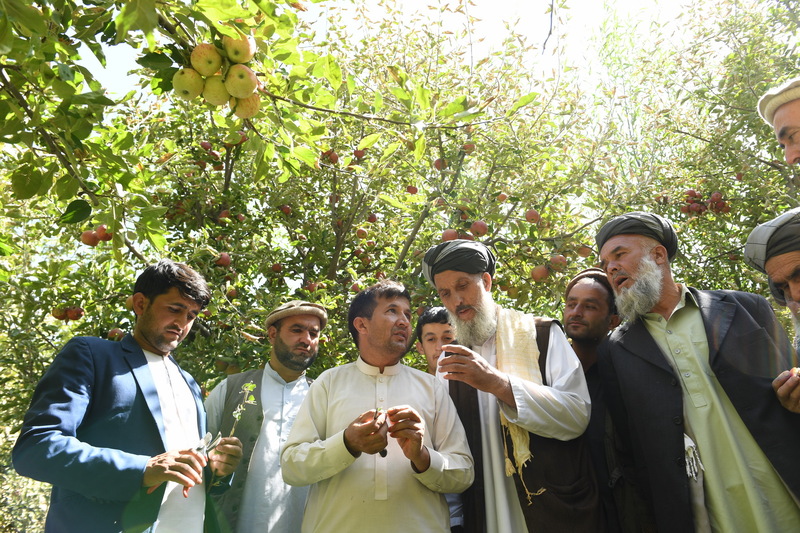 In rural Afghanistan, the Aga Khan Foundation conducted over 630 Integrated Crop Management Campaigns across its target regions to promote sustainable agricultural production. Over 27,500 farmers (32% women) benefited from these campaigns, which included the promotion of pruning, grafting, budding, and pest control. Trainees learn how to produce raw honey at the Honey Processing Centre in Takhar, Afghanistan. In 2017, more than 1,100 young men and women (78% women) received market-driven vocational training in 14 different areas including construction, service, handicraft and agriculture. Some 75% of the trainees have found jobs or started their own businesses. In rural Afghanistan, the Aga Khan Foundation works with communities to build inclusive, pro-poor, participatory and accountable civil society and governance institutions at the village, cluster, district, and provincial levels. These organisations adopt democratic forms of governance that encourage local people to drive their own development. The Aga Khan Foundation (AKF) has been active in Afghanistan since 2002. It implements activities in Participatory Governance, and Natural Resource Management among other activities. CDC (Cluster Development Council) meeting in Jurm, Afghanistan. Members discuss the urgent need for volunteers to help repair a water system, washed away by heavy rains. The system was build thanks to the collective efforts of several communities, who contributed funds and labour. AKF provided technical support. 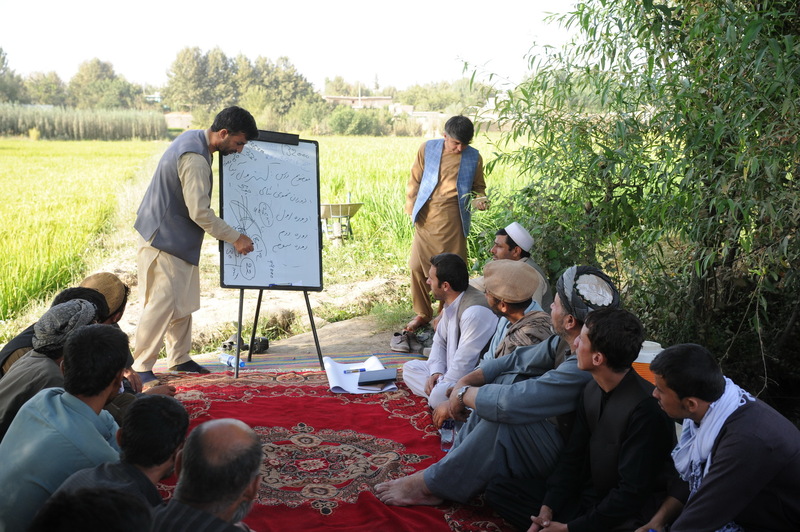 Since 2003, the Aga Khan Foundation (AKF) has worked on building human and institutional capacity as a Facilitating Partner for the National Solidarity Programme (NSP), a government programme that establishes Community Development Councils (CDCs) across Afghanistan. The programme is intended to empower local communities to identify and implement their own development projects. The approach is well-aligned with AKF’s commitment to engaging communities in order to promote local ownership and sustainability. AKF’s NSP programming now covers over 1,500 CDCs in 28 districts in five provinces. AKF designed and implemented the “NSP Plus” programme to accelerate and deepen the CDC capacity development process, by incorporating trainings on poverty mapping, gender awareness and conflict mitigation into its work. Several of these components are now included in national plans for NSP and are implemented by partners across the country. Recognising that many development issues require collaboration beyond the village level, AKF has also undertaken significant capacity building with Cluster Level Development Committees (CLDCs), District Development Assemblies (DDAs), district governor offices and provincial line departments on issues including community participation in reforestation and girls’ enrolment in school. Through these activities, AKF has reached over three million people in 55 target districts with funding support from the Afghan Government as well as Germany, the United States and Norway. The Farmer Field School in a demonstration orchard in Baharak. AKF is working with farmers to increase the number of orchards and improve the quality of produce. Demonstration orchards, along with a network of community and commercial nurseries are helping to revitalise the once vibrant horticultural sector. 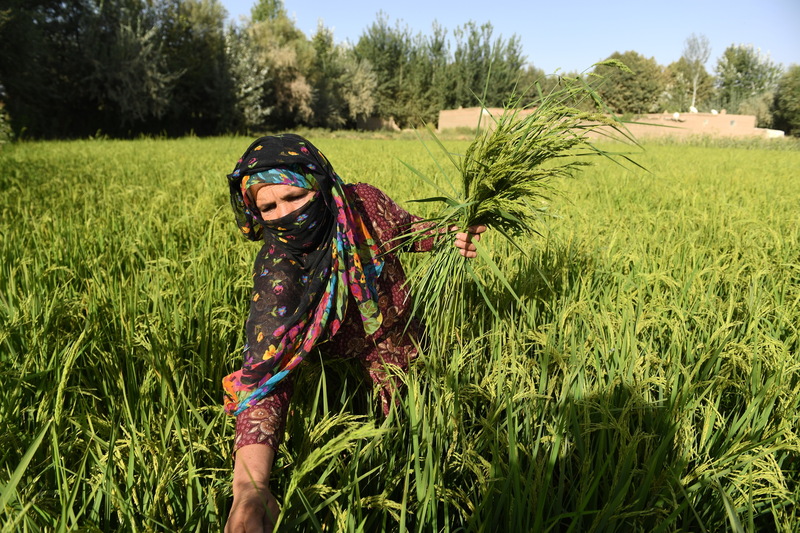 With around 80 percent of the Afghan population dependent on agriculture, interventions in this sector are central to reducing poverty rates. Over the past 10 years, the Aga Khan Foundation (AKF)’s agriculture and NRM programme has transitioned from distribution of agricultural commodities to more sustainable activities that have led to increased production, improved food security, and stronger connections to markets for local farmers. The Natural Resource Management (NRM) programme has reached more than 2.1 million beneficiaries through its work in field crops and horticulture, land and water management, and livestock. Since 2003, AKF has supported 35 private input suppliers that are now fully sustainable and provide improved seed varieties, fertilisers, pesticides, agricultural equipment, training and technical services (e.g., pruning) to over 400,000 farmers annually. Nine fully-privatised Mother Stock Nurseries (MSNs) provide varieties of more than 80,000 improved root-stock and saplings to more than 1,000 farmers per year. These interventions have contributed to increases in the average productivity of wheat (58%), potato (25%), apple (116%) and vegetable (25%) since 2005. On-farm skills development takes places through Farmer Field Schools (FFSs), participatory technology development groups, integrated crop management trials, demonstration orchards and field crop plots. These interventions allow farmers to share experiences with improved varieties and new technologies. AKF is now focussing on training government extension workers to train farmers through FFS. AKF has also provided significant support to government agriculture research stations in three provinces, four biological pest control labs covering the programme area, and a virus-indexing laboratory in Kabul. Most of these institutions have now been handed over to government. To promote sustainable management of natural resources, AKF has trained the Community Development Councils (CDCs) to implement common property resource plans across the programme area. These plans are complemented by land treatment measures that redress the extensive denudation of watersheds and rangelands. Twenty-three Water User Associations (WUAs), 63 Pasture Management Committees and seven Watershed Committees in five provinces have benefited 630,000 people with 40,000 hectares of land rehabilitated and irrigated for better resource use. AKF has also established 35 Livestock Development Centres (LDCs), 80 percent of which are now fully privatised. These LDCs and 140 associated Livestock Development Field Units have provided access to animal health services for more than 1.2 million people. Livestock farmers in target areas have reported a 65 percent reduction in animal mortality and morbidity, and farmers reported a 35-40 percent increase in milk and meat production and 25 percent increase in herd size in the past five years.